It’s my goal this year to have about 75% of the gifts I give be completely homemade. I’ll let you know the week before Christmas how I have done; or maybe I won’t have time to let you know because I will be cramming to get them all done! Anyhow, I’ve been working on some of the smaller items I plan to give teachers, neighbors, and friends. As you can see it contained sheet music magnets and decorated candles. This year, I am going in a different direction but using magnets and candles again! After all, they are both gifts that people can always use! This year for the magnets, I again used glass gems. I painted the flat side of the clear gems with Mod Podge, and then sprinkled glitter onto them. Once that was dried, I added 3 more coats of Mod Podge as I wanted to be sure the glitter was really sealed in there. Once that was dry, I used my hot glue gun to glue a magnet to the glittered gem, and voila…. sparkly magnets! I just bought some other colors of glitter, too, so plan on making more. What is also really great about this project is that with its level of ease, it’s something you can do with your kids. Emmy helped me glitter them, and that way she is now involved in creating gifts for her teachers, which I love! I used some glass spice jars, a vintage jar, and a couple other vintage dishes. I can’t wait to get to work on more! Don’t forget to enter my Mikarose giveaway! « Monday Giveaway from Mikarose! So neat! That little sugar bowl is going to be such an interesting candle! That’s awesome Cassie! I actually have supplies to try candle making this year too! I saw the idea at BHG.com I think, but I’m glad to see a real person try this project with success because you never know how those “magazine” projects will turn out in real life. I love it!! was just telling Brianna that I need to make do it yourself presents for Christmas this year since the funds aren’t quite up there. This gets the ideas flowing!! Oooooh…..one thing that I’m not sure I admitted when you were here (or maybe I did) was that I am a TOTAL candle-aholic!! I took a small hiatus in the beginning of being pregnant (any smells at that time were awful – lol), but am back ‘on’ and have a candle lit practically at all times. I am so excited about your new endeavor!!! 🙂 I bet they smell amazing! Love the glitter magnets! I’m trying to make a bunch of my gifts this year, too. I have my knitting supplies out for the trip up to Rochester and back for Thanksgiving. Hopefully I’ll be able to knock out a few on the road. Love the idea of the soy candles in the vintage dishes. So pretty! Thanks for sharing. Oohh—-I love soy candles! I bet they turned out great. Cassie, I love the idea of using old sugar bowls for candles – so clever! I’m going to have to raid my mom’s house for sugar bowls and tea cups to do this!!! Those will be some really nice gifts! I like the idea of using old china for the candles! Your house is going to smell wonderful! love the sugar bowl candle!!! And I totally would not be mad if one of those ended up in my stocking this year 😉 just sayin’. Great minds think alike!! My sister and I just ordered a batch of soy wax flakes to make gifts for Christmas this year too. So glad you are happy with how they turned out. I can’t wait to try them. Those will make wonderful gifts! How fun to make your own candles. Good for you! Lavender and vanilla sounds yummy! Love the glitter magnets, too. This sounds like a great idea! 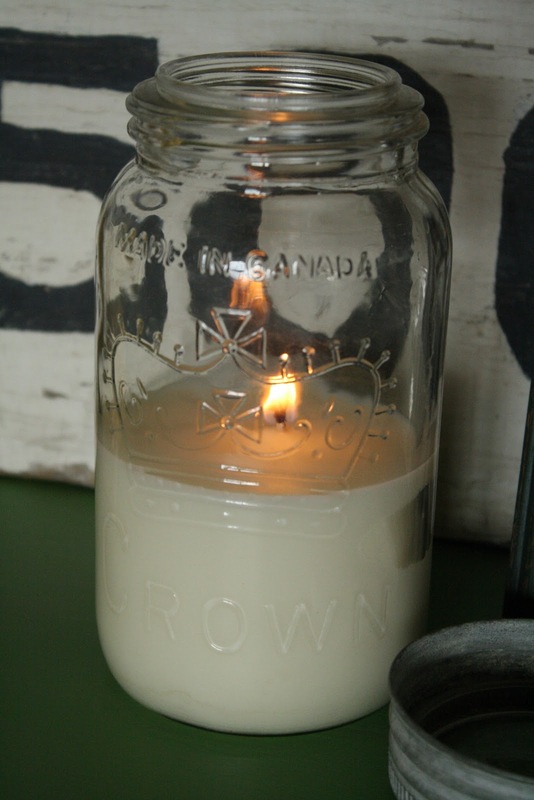 I’ve never made candles…where can you buy soy wax? I’m making a lot of handmade gifts this year as well and this seems perfect. I love your candles and I bet they smell yummy! And I love that you are mixing it up and trying new things! I think I need to add this to my “project” list! I love the idea of candles in all sorts of containers! I love this idea. The containers you used are so unique. My kids would love to get in on this action too. Think I may give it a try. haha, so I’m not the only one burnt out on painting furniture!!?? i might have to try out this soy candle thing!! what a great gift to give neighbors, teachers, and friends 🙂 Happy Thanksgiving!! Super cute glitter magnets – love those!